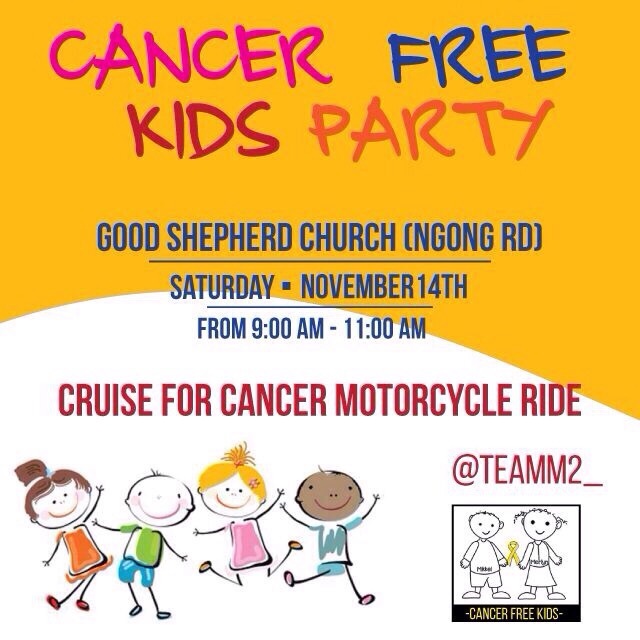 Africa Cancer Foundation would like to invite you this weekend to the #cruiseforcancer event that will be taking place on Saturday, November 14th from 9-11 am at the Good Shepherd Church along Ngong Road. This is a team up campaign organized by The Tin Roof Foundation, K-Krew Trust Colour my World, Africa Cancer Foundation and Joe Aketch Foundation; among others, to raise funds for Mikkel and Merlyn and by extension the children with Cancer in the Kenyatta National Hospital. Team Up is the campaign for Team M2 (Team Mikkel and Merlyn) sponsored by Tin Roof Foundation, K-Krew Trust and Africa Cancer Foundation to raise the necessary funds for the cancer treatment and aftercare of 2 ½ year old Mikkel and 15 year old Merlyn. To join this activity, we are asking you to build a Team from your family, co-workers, sports team, motorcycle club, church group, university or any other group of people, to Team Up for Mikkel and Merlyn and to be a part of their story of beating cancer. Mikkel is a 2 1/2 year old little boy from the Ongata Rongai area of Nairobi. He was diagnosed with Hepatoblastoma at four months old but due to lack of adequate treatment his condition has progressed to Neuroblastoma. Due to the generosity of the friends of Tin Roof Foundation, Mikkel is currently a patient at the Max Super Speciality Hospital in India, but funds have run out and his treatment has stopped. If he does not receive the treatments the doctors have said his chances of survival are very low. Merlyn is a 15 year old girl from Nairobi who was diagnosed with an aggressive form of Lymphoma. Due to proper treatment not being available in Kenya, her parents arranged for her treatment in India. Merlyn spent December 2014 – July 2015 receiving aggressive treatment in India. 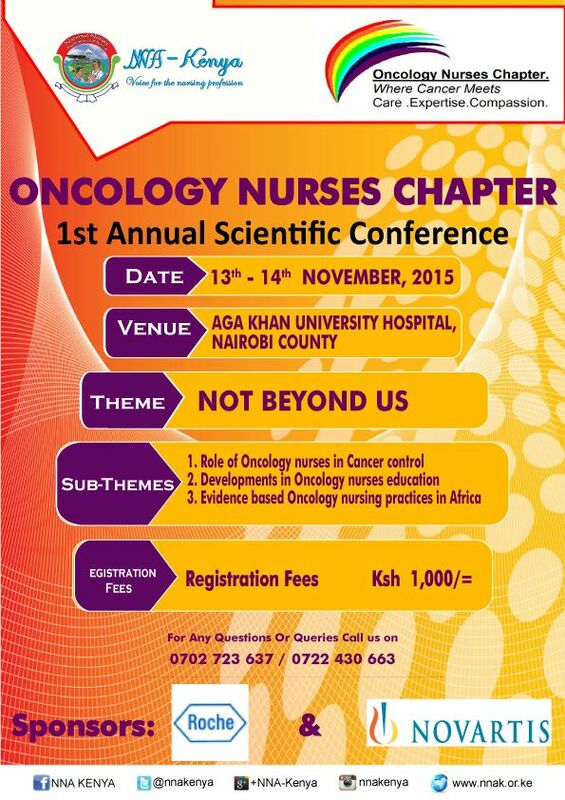 After her return to Kenya the cancer has returned. Her parents used all their finances to fund her December – July treatment and have nothing left for the next round of treatment that is desperately needed. The doctors have stated that she needs to return to India by the end of November 2015 in order to halt the cancer from spreading. During the event you may bring your donations in the form of cash, Stationery or toiletries for the children. There is an adage in the cancer community that any public lecture on cancer must have a generous serving of food, politics, and science. Cancer survivors in any public forum always demand to be told which foods gave them cancer while the public wants to know which foods cause cancer. Though we cannot pinpoint one single food item and say it is responsible for all cancers, there is unequivocal evidence that unhealthy foods and drinks are among the key lifestyle drivers of the rising cases of non-communicable diseases. Policies and practices that promote healthy eating from infancy to adulthood should, therefore, be prioritised, although legislation on the advertisement, distribution, and sale of some of the unhealthy food products is largely lacking due to political lethargy and vested interests. The growing Kenyan middle class has adopted peculiar eating habits that exclude vegetables, yet there is clear evidence that diets high in fruits and vegetables — as well as whole grains and beans — decrease the risk for some cancers, notably those of the bowel. The meat-based diets favoured by the moneyed lot, especially nyama choma and processed meats such as hot dogs and sausages, are associated with an increased risk of colorectal cancer, according to the just-released World Health Organization expert panel report. These foods should be consumed in moderate amounts and certainly not in the quantities that Kenyans consume every weekend. The copious amount of alcohol, which our nyama choma weekend binge eaters use to wash down their indulgences, is a known risk factor for several cancers. Shisha and related tobacco products, all loaded with potent carcinogens, usually complete the party that leads to disease, disability, and death. The young are not left behind in this unhealthy eating frenzy. They indulge in carbonated drinks full of refined sugar. The soft drinks industry has always pushed a subtle message that it is not diet but lack of exercise that is to blame for obesity and unhealthy lifestyles. Children and youth in the emerging markets of the developing countries are a particularly vulnerable target of aggressive and relentless marketing by multinational food and fizzy drinks companies. The mother of all public health advocacy coups would be legislation requiring all soda cans and bottles to have warning labels that sugar causes obesity, among other health problems. Perhaps sausages and other processed meats should also carry some disclosure of the cancer risks. This would definitely invite drawn-out court battles, injunctions, and counter-injunctions. The way to promote healthy choices is to package science-based public health messaging on established lifestyle risk factors — such as obesity, inactivity, tobacco, alcohol, unhealthy diets — in a way that is attractive to the youth. Goal number three of the recently adopted Sustainable Developments Goals seeks to ensure healthy lives and promote the well-being for all at all ages. There is no shortcut to achieving this particular goal: physical activity and a deliberate effort to change our eating habits will be a good start.